Ashton Kutcher and a slew of other celebrities chowed down on gourmet offerings in Las Vegas this year. LAS VEGAS (TheStreet) -- The biggest names in the worlds of sports and entertainment gathered for four days of competitive golf and exclusive events March 29-April 1 when ARIA Resort & Casino (MGM - Get Report) at CityCenter hosted the 11th Annual Michael Jordan Celebrity Invitational. The invitational returned to the exclusive Shadow Creek Golf Course, which opened to spectators for only the second time in its history. Normally reserved solely for guests of MGM Resorts International, the experience includes a limousine that transports you to and from the Tom Fazio-designed course and upon arrival, your personal caddie greets and guides you through a golfing experience you will never forget. Proceeds from the charitable tournament benefited the Make-A-Wish Foundation, Univerity of California-San Diego Nevada Cancer Institute, James R. Jordan Foundation, Opportunity Village and Cats Care, the NBA's Charlotte Bobcats charity arm. 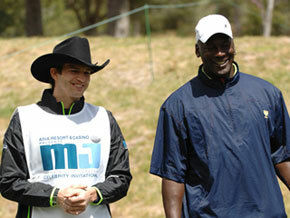 Since its inception, MJCI has raised more than $6 million for charity. TravelsinTastebrings you the scoop in what went down during the four day event. Ashton Kutcher and Michael Jordan took to the links recently during Jordan's celebrity golf invitational at the exclusive Shadow Creek Golf Course. The first round commenced March 29 with groups comprised of one celebrity with four amateur golfers. Throughout the tournament, The Spa & Salon at ARIA sent its most skilled barbers down to the course to provide golfers with hot shaves and trims in the men's locker room. At the end of the first day participants celebrated with a private party at LIQUID Pool Lounge, the adults-only outdoor playground at ARIA that recently opened for the summer season, hosted by Jordan Brand. Throughout the tournament M life VIPs, MGM Resorts unique rewards program that offers unparalleled access to the best of Vegas, were treated to the best view of the course in a luxurious hospitality tent overlooking the green on the 18th hole. The VIP second level served up refreshing specialty cocktails featuring Ciroc vodka, including The Diddy - an homage to Ciroc's founder - and a delicious blend of vodka and lemonade, perfect for the day. Additionally, food was plentiful - including a breakfast ranging from light fruit displays of spring fresh sliced melons, berries, varietal grapes with lavender honey sauce; to hot and savory scrambled eggs, applewood smoked bacon, chicken sausage and sliced red bliss julienne onions with herbs. Highlights from the lunch menu include sliced heirloom tomato and mozzarella bocconcini with balsamic glaze, herb-crusted beef tenderloin with watercress and horseradish cream, and wild mushroom roasted chicken with onion cream sauce. VIPs were kept satisfied with crudités and tea sandwiches throughout the afternoons. Celebrities were omnipresent at the event and the legend himself, Michael Jordan, was in great spirits during the tournament, driving around in a Carolina blue No. 23 golf cart blaring R&B tunes. NHL wonder Brett Hull must have been excited about his shots for the day, as he literally skipped his way to the 9th hole where he earned a par. Multi-talented actor and producer Ashton Kutcher made a surprise appearance as Michael Jordan's personal caddy for the back nine on the final day of the tournament. Kutcher joked throughout the day with his foursome, which included The Office's Brian Baumgartner and NFL superstars Aaron Rodgers and Dwight Freeney. Unfortunately Jordan didn't take the top prize, but he graciously annointed the tournament winners: former baseball pitcher and sportscaster John Smoltz and World Cup Champion Brandi Chastain. Jordan and Kutcher took the loss to Smoltz and Chastain in good spirits, with Kutcher noting, "If you're not going to win, have fun." One of the specdial highlights of the event was a celebrity-laden gala dinner. After the red carpet walk and the ensuing reception the guests were brought to their tables to commence the fabulous dinner in store for them. Celebrities were spotted grabbing multiple plates so they could fill it with selections such as braised cod from barMasa; braised veal cheeks with king trumpet mushrooms, creamy white polenta and black garlic from Sage; cheese ravioli with basil pesto, porcini mushrooms and toasted pine nuts from Sirio Ristorante; ocean water poached scallops with buckwheat noodle and sake broth from AMERICAN FISH; and Angus 300 NY Strip Steak with soy miso butter from Jean Georges Steakhouse. Celebrity chef Julian Serrano was on hand to prepare delectable dishes from his restaurant, Julian Serrano, including succulent chicken fricassee with Iberian pork pancetta, mushrooms, vegetables, cream, and sherry wine, and canelones de carne: a spanish cannelloni with chicken, beef, pork, foie gras, and béchamel sauce. Upon his arrival, Serrano paid homage to Michael Jordan's famous "jump man" pose on the red carpet, much to the delight of photographers and spectators alike. Before you write up your away email, here are 5 money saving tips you may want to consider before going on vacation.